With the division title secured and the fourth seed in the AFC playoffs locked up, the Kansas City Chiefs (9-6) have decided to start Patrick Mahomes in week 17 against the Denver Broncos (5-10) at Mile High. 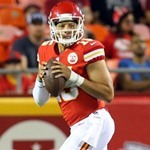 The Chiefs believe they drafted a very special quarterback in Patrick Mahomes Jr. and now they want to give him some experience because during the offseason Kansas City is expected to trade Alex Smith and hand Mahomes the reins. This is not an audition for the postseason, they’re not giving Mahomes playing time now to get him ready for the Chiefs’ AFC Wild Card game. This is just a move to rest Smith, to make sure he is healthy as they prepare to enter the playoffs and to give their quarterback of the future some added experience for 2018 and beyond. Even though the rookie had a stellar preseason and will face an almost no-pressure situation, the Chiefs want to get a glimpse of what he can do in a regular season game surrounded by the hostile environment, and the raucous fans of a division rival. Now, the Chiefs have made it clear that barring any injury to Smith, and regardless of how well Mahomes plays, Smith will be the starter in the AFC Wild Card game and the rest of the playoffs. Mahomes is a quarterback that likes to take chances and does a lot of things that Smith doesn’t do. He has a huge arm, but he won’t start in the playoffs even if Smith struggles because he still has a lot to learn before he can step in and deal with the added pressure of leading his team through the postseason. Mahomes was the No. 10 overall pick in April’s draft after the Chiefs traded up to select him. He has yet to play in a regular-season game amid the team’s playoff push. Smith leads the NFL with a 104.7 passer rating as he’s passed for 4,042 yards, 26 touchdowns and was picked just five times in 15 games.